Milling along the shoulders is well underway. 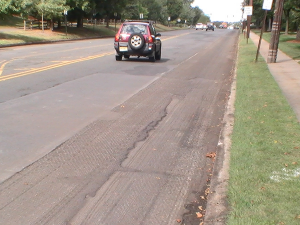 Navigating JFK Boulevard over the next couple of weeks will be dicey, as a good chunk of the road undergoes a rehab. Work has begun on the first phase of the resurfacing project. That first phase stretches from New Brunswick to Webster roads, said Township Manager Bob Vornlocker. The second phase will extend from Webster to Hughes roads, he said. The project, which the township hopes will be paid for by a $200,000 state grant, should be done “by the last week of September, first week of October,” Vornlocker said. The Township Council at its Sept. 10 meeting approved a resolution to apply for the state grant through the state Department of Transportation. “There will be lane closures, but no full road closures,” he said.